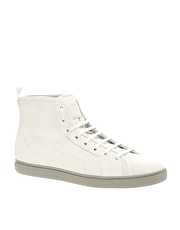 Produktbeskrivning för HUGO By Hugo Boss Pighdo Canvas Hi-Top Trainers: Trainers from HUGO by Hugo Boss . Featuring a classic and clean hi-top style with a lace-up closure, a pull-on tab to the back, a rubber toe cap, bound trim and a contrast rubber sole. ABOUT HUGO Progressive, creative and individual, HUGO by Hugo Boss specialise in directional mens clothing with a timeless appeal. With Hugo Bosss inimitable style at its core HUGO offers forward thinking menswear in the form of tailored suits and shirts, knitwear and accessories.